Edgewood makes some of the best front and rear shooting bags you can buy. 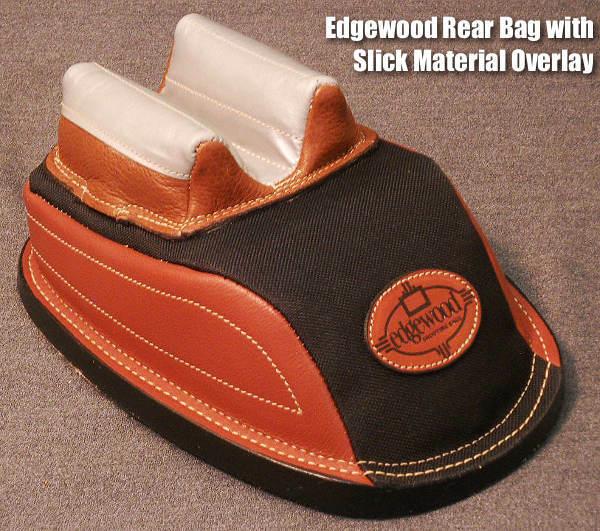 And the latest Edgewood rear bag is better than ever, with a new hybrid “slick material overlay”. This combines the shape retention and stability of leather ears, with slick, low-friction material where the stock rides. This “best of both worlds” solution delivers both bag stability and improved tracking. Derek Rodgers, the only man who has won BOTH the F-Open and F-TR National Championships, is using this new rear bag, and he says it’s excellent. He says his gun tracks great with the slick material on top of leather-based ears. 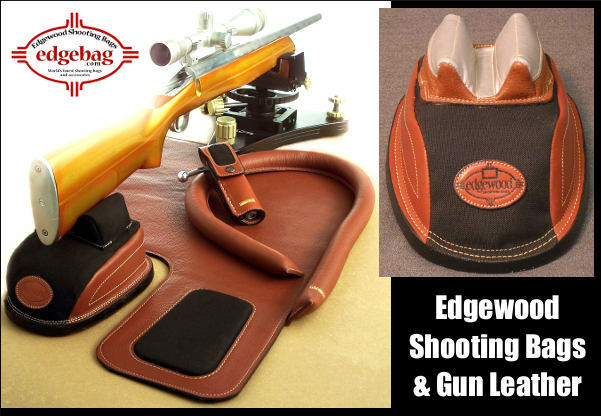 You’re probably familiar with Edgewood for its high-quality shooting accessories. 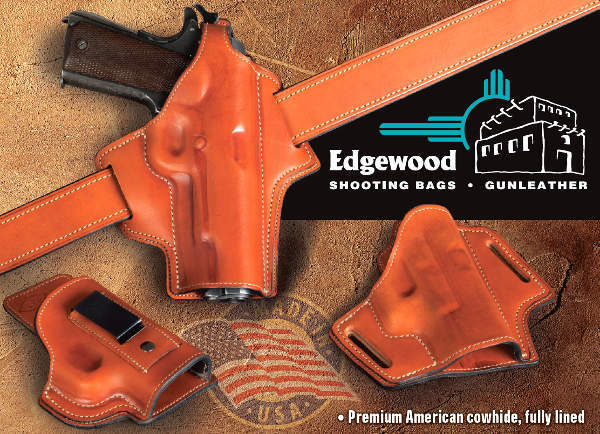 You may not know that Edgewood also offers a full line of quality leather holsters. And we bet you didn’t know that Edgewood got its start making tack and bridles for horse riders. 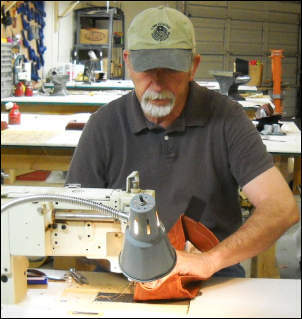 Here’s a short history of Edgewood Leather, a family-run business based in Albuquerque, New Mexico. I’ve always enjoyed working with leather and still do to this day. Something about starting with an idea and building a useful and hopefully, beautiful piece does it for me. There’s nothing like leather to stimulate my imagination. It brings out my creativity and makes me happy. I began doing leatherwork as a kid, 12 or 13, and the first piece I made was a pair of shoes. Got a job in a leather shop in the late ’60s and made purses and belts, wallets and sandals — many pairs of sandals. I opened a small retail shop in Estes Park, CO and made even more of the same, adding vests, halter tops, hats, mountain man gear of all sorts from skunk hats to goat fur high-top moccasins. After a decade or so, I became restless for something new and taught myself bridle work. I discovered a niche market with English riders who were always looking for beautiful, well-fitting show bridles and over a period of about twenty years developed and produced many products for these riders — numerous types of nosebands, breastplates, martingales, girths and many different varieties of reins. At the same time I observed that for every horse and rider there were at least two dogs trotting along beside. I began making dog products which closely resembled their horse buddies bridle work. Sales were good. Leashes, leads, halters and collars showed up at dog shows around the country. My bridles were worn by many champions in every horse discipline — dressage, show ring, hunter-jumpers, and my polo gear became popular among the players. All of that was fun and I’m still proud of those products (still being made today), but it was time for a change. I sold my interest to my partner and tried to retire. Didn’t work, though. My plan was to shoot benchrest matches, as many as I could. And I did for some time and loved every minute. I’ve made many friends among the shooters, discovering early on that these people are the most interesting, smart folks a guy could ever associate with. To the man, they’ll share what they know with you and even hand you their gun when yours malfunctions during a match, and grin and slap you on the back when you beat ‘em with it! When I was getting started in benchrest, one aspect of the game was somewhat disappointing to me-the quality and stability of the shooting bags. 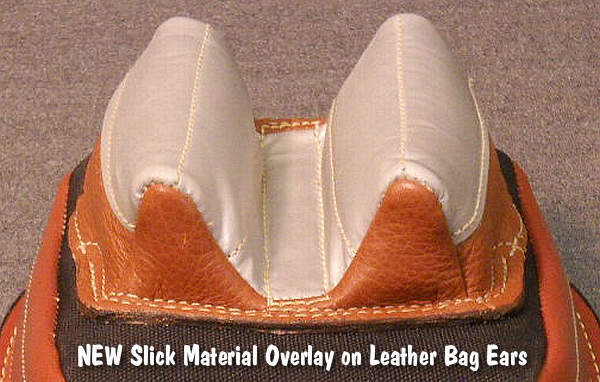 It was natural with my past leather experience to make what I thought would be a better product. I cobbled up a couple of bags and went to a match in Oklahoma. All hell broke loose. Most of the shooters had to have one. By the end of the summer, I had so many orders for shooting bags, I couldn’t keep up the pace. I was improving the designs, based on the shooters telling me what worked and didn’t work. I was adding new products, experimenting with materials, processes and configurations and having a great time. Completely by accident, Edgewood Shooting Bags was born. My wife Cindy and my two kids Jackie and Aaron jumped in and we became a bag-making machine — always looking to improve and expand upon the products. Jackie’s husband Ryan joined us several years ago and together, we’ve made a pretty awesome team. Since we’re all avid shooters with many handguns among us, the next logical product to add to our catalog would be a line of high-quality leather holsters. For the last year or so, we’ve come up with what we believe to be the most comfortable, elegant holster out there. Affordably priced, these holsters are are available in many different styles and configurations, for both outside carry and concealed carry. Edgewood constantly strives to improve its products. Witness the new “slick material overlay” bag ears. This is a major design improvement over our regular “slick ears”. The development of the overall design all started when we noticed some shooters applying household products like talcum powder or dryer sheets to the ears of their bag in an effort to reduce friction and speed up their rifle’s return to battery. We found a material that would achieve this function without the need to raid their wife’s pantry for powders or laundry accessories and began sewing the ears up using this “microscopic glass bead impregnated” fabric. We were happy with the results. However, we soon began to realize that the slick material could have the longevity of our nylon as well as its slick properties, if we found a way to increase its thickness without causing wrinkles or inconsistencies. First, we ended up hunting down some similar fabric with a much higher strength and thickness. It even has a fireproof backing that makes it far more durable — even if shooters aren’t planning on exposing it to temperatures higher than the Arizona desert can offer. This material was definitely superior and even more representative of the quality and durability that shooters have come to expect from products wearing the Edgewood logo. We didn’t stop there, either. We started experimenting with a way to combine our toughest ear design, which is made from soft leather, with the slick material to create the best of both worlds. We deemed it the “slick overlay” option and many of the world’s top shooters now swear by it. There is no compromise with this ear set — shooters gain all of the advantages of the slick material, in addition to durability and consistency that exceeds even our tried and true nylon ears. Many of our original bags have been punished by shooters for over a decade and are still performing. We expect this design to last even longer. Keeping ahead of the curve with innovations that create and help propel evolution in the sport is a signal of our commitment to retain our status into the future. Along with other new products like our second generation of concealed and open carry holsters, range bags for sighting in hunting rifles, radius front bags for AR-style rifles, camouflage color options and more — we even have a new logo for 2016. Check us out online or give us a call. We’re ready to meet the demands of shooters — from Benchrest and F-Class to concealed carry and IDPA. 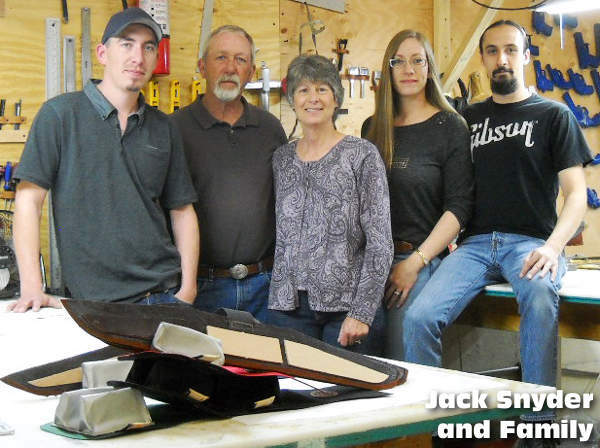 Share the post "Company Profile: Edgewood Shooting Bags and Gun Leather"